Whether to inhibit corrosion, improve appearance or smooth sharp edges, metal finishing is essential to many industries. According to data gathered by IndustryNet, 4,093 metal finishing companies with current sales of $36,890,189,770 provide 93,022 jobs. Metal finishers vary in both specializations and capabilities. Understanding the types of metal finishing is vital to choosing the right vendor. This article is intended to help customers find the best and most economical solutions to their finishing needs. There are many types of coatings and a wide array of methods to apply them. Even a coating as familiar to a consumer as paint can have a multitude of varieties. Paints can be solvent-based, water-based, or entirely composed of film-forming components. Each type of paint will need the appropriate methods and equipment to apply and cure it. Coatings can also be sprayed on as powders and heated to liquidity, creating contiguous coverage. Both powder and paint may be applied either manually or robotically by spray guns or bells that impart an electrical charge, which causes the paint to be attracted to grounded metal parts. The Faraday cage effect may interfere with this type of application method, and some coaters choose other technologically advanced coating techniques such as plasma arc, flame spray and thermal spray. • Reducing or increasing the effects of friction. Experts in design and engineering, Metallic Bonds Ltd. maintains its own research and development facilities in Beloit, Wisconsin. Its processes include flame, thermal, powder, thermoplastic and metal sprays. The company offers services such as manufacturing and maintenance engineering, design enhancement, salvage and reclamation, and machine repairing and rebuilding. The firm has also introduced robotics into its shop, which can lower the costs of large jobs. S & B Finishing Co. Inc. in Chicago, Illinois, offers both liquid and powder coatings applied with electrostatic equipment. Its additional services include design, assembly, packaging, silkscreening, and pickup and delivery. A staff of 50 work in a 35,000-square-foot facility. This company is ISO 9001:2015 certified. Click here to see a full list of hundreds of companies that specialize in various types of coatings, including aluminum coatings, conductive coatings, corrosion and heat-resistant coatings, and powder coatings. Plating produces films in varying thicknesses. The thinnest films have depths as low as one atom and have been adopted for use in nanotechnology. While many plating facilities contain tanks of precisely controlled solutions in which parts may be immersed, other forms of plating include vacuum and sputter deposition, and electroplating. Some platers also coat plastic surfaces by a project known as metallizing. Automation Plating Corp., in Glendale, California, is ISO 9001:2008 certified and CQI-11 approved. It has been in business for over 60 years. In addition to zinc plating, its capabilities include electroplating and barrel plating. Professional Plating Inc. is an ISO 9001:2015 certified company in Brillion, Wisconsin. Its capabilities include both zinc and black zinc plating as well as electroplating. It also performs other finishing services, including powder coating, painting and e-coating. Over a thousand plating companies listed with IndustryNet include numerous electroplating companies and those specializing in aluminum plating, zinc plating, black oxide plating, copper plating and gold plating. Click here to see the full list. Heat treatment dates back to techniques developed by blacksmiths. Heat treatment deliberately alters the physical and sometimes the chemical properties of a metal by changing the crystalline structure. Heating and cooling due to other processes such as welding may incidentally change metallic structure but are not classed as treatment. One type of heat treatment is annealing. Metal is heated to a high enough temperature to affect its microstructure and slowly cooled. Annealing softens metal, making it easier to work. Quench hardening also involves heating but cooling proceeds more quickly, often by immersion of hot metal in water or oil. Annealing and quenching will harden steel at the same temperature. Because the time involved is shorter, quench hardening is generally cheaper than annealing. Precipitation or age hardening is a process that increases the strength of a treated material by making the structure more uniform. Heating follows fast cooling. This method may take one to four hours. Tempering makes metals less brittle. They are heated to temperatures lower than those used for annealing. Tempering increases the workability of metals but may result in a loss of strength. After other heat treatments metals may be stress relieved, to prevent breakage. Stress relief utilizes a temperature lower than the initial treatment. Cooling involved in this process is slow. Two companies performing heat treatment, follow. Chem-Plate Industries in Elk Grove Village, Illinois, has three plants with an area totaling 280,000 square feet. 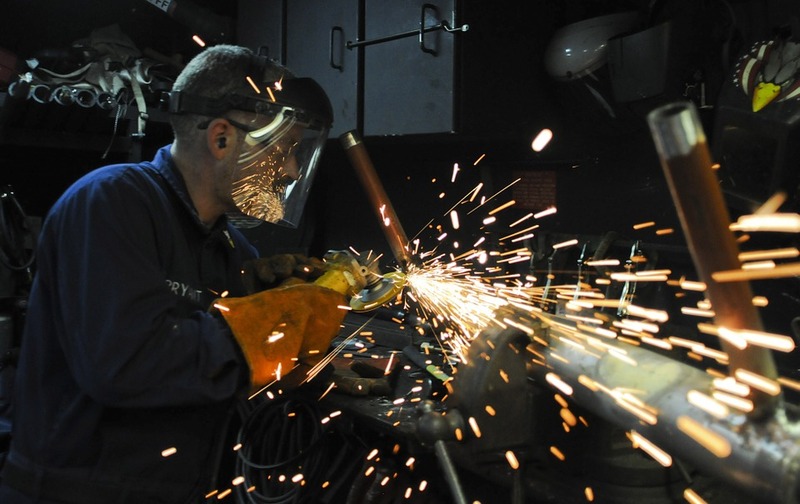 Its heat treating specialties include hardening, stress relief and annealing. Industries Chem-Plate serves various industries, including construction, military, agriculture and transportation. The company is certified to ISO/TS 16949. Atmosphere Annealing, LLC/ A Division of Premier Thermal Solutions offers heat treating services with quick turnaround times from its Lansing, Michigan, facility. The company is ISO certified to TS 16949, QS 9000 and 14001. The hundreds of U.S. heat treating companies listed with IndustryNet include those specializing in black oxide heat treating, bar stock heat treating, aluminum heat treating and more. Click here to see the full list. Grinding is a process used to shape and finish surfaces by removing material. 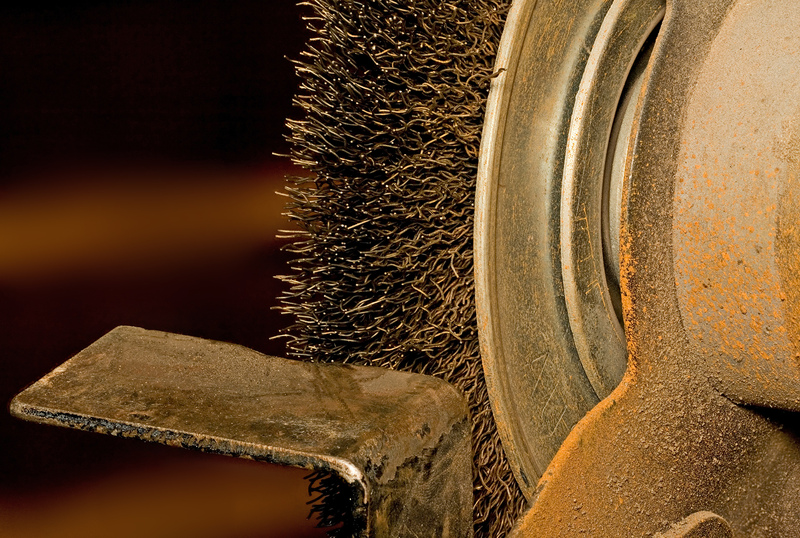 Grinding requires the use of an abrasive, often a wheel that contacts the surface of the metal in a controlled way. Cylindrical grinding produces surfaces that may be tapered or straight. Internal grinding is executed inside previously drilled holes. It can be used to ensure that the inner diameter of a hole is correct or to introduce a taper. In centerless grinding, the object being finished rotates between two wheels. This method allows the feeding of a continuous stream of objects to be ground through the apparatus. Surface finishing is accomplished by using a wheel above the plane to abrade a part or component and produce a flat, angular or contoured finished product. The grinding process often uses lubricating fluids. Electrochemical grinding uses a conductive fluid to dissolve metal from metal pieces in which a charge has been induced. The type and cleanliness of these fluids impact the quality of the process. Other factors affecting outcomes are the condition of abrasive wheels and the age and maintenance of grinding machines. Midwest Grinding Co. Inc. in Milwaukee, Wisconsin, is a specialist in flat surface grinding and performs continuous feed grinding as well. Its additional services include providing raw materials to customers. Midwest also performs fabrication and heat treatment. MAH Machine Co. Inc. is a precision machining job shop. It performs both inner and outer diameter grinding. The Cicero, Illinois, company also has 15,000 square feet devoted to rebuilding machinery. 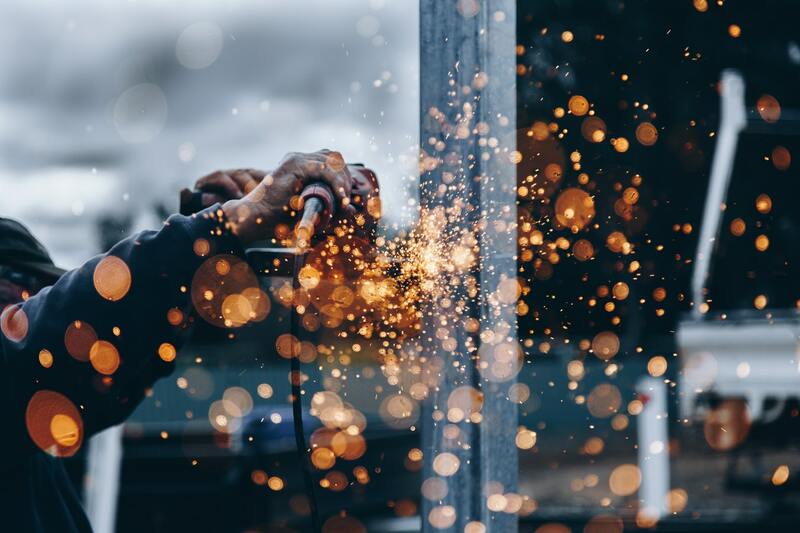 Click here to see a full list of grinding companies on IndustryNet, including those specializing in carbide grinding, CNC grinding, steel grinding, precision grinding and more. Anodizing creates a thin film of oxide on the surface of aluminum and other metals such as titanium, magnesium, zinc, niobium and tantalum. The oxide layer increases corrosion resistance and produces a harder finish. Though ordinarily colorless, oxide layers can be tinted by immersion in dyes. This method can create an attractive finish at a lower cost than plating. Anodized aluminum is found on objects ranging from smartphones to window frames. Read more: Top U.S. anodizing companies. The porous oxide layer of anodized metal can be imprinted with photographic quality images. Several methods including digital printing can apply dyes. Items are sealed after color is applied. This technique is used to produce graphics on objects as varied as baseball bats, signs, surgical trays and motorcycle components. Two anodizing shops serving diverse markets are listed below. Global Metal Finishing Inc. in Roanoke, Virginia, delivers hard coated anodized parts to its customers within 24 hours. The company is certified to AS9100D and ISO 9100:2008. Global serves the aerospace and marine industries. Precision Metal Finishing LLC in Grand Junction, Colorado, offers anodizing to MIL-A-8625 Types II and III. Colors offered are black, red and blue with special requests available. The company is Nadcap certified. Click here for a list of companies offering anodizing. Polishing is smoothing the surface of a metal piece. The process may be carried out using an abrasive. Polishing improves appearance and may be combined with a chemical agent to remove oxidation (tarnish). Multiple abrasives may be used in stages, starting with the coarsest type and finishing with the gentlest, to produce the desired finish. Polishing equipment consists of wheels bonded to abrasive media. Electropolishing is an alternative to the use of abrasives and mechanical equipment. A reverse current is passed through a metal piece while it is immersed in concentrated acid or an alkaline solution. A film formed during this process fills microroughness of the part, creating a smooth surface. A variety of electropolishing chemicals are employed, depending on the type of metal to be treated. The companies profiled in this section give a wide variety of products their shine. Gascoigne Company in Waukesha, Wisconsin, was founded in 1931. It offers polishing services for stainless steel, using electropolishing or a succession of wheels to achieve the desired effect. Gascoigne can polish parts ranging in size from nuts and bolts to 9-foot lengths. It performs electropolishing to ASTM B912, the standard for passivation of stainless steels. South Haven Industries Inc. in South Haven, Michigan, provides services to a wide range of industries, including watercraft, automotive and plumbing. It will accept work on all metals, including specialty metals. The company prides itself on its ability to salvage any cosmetic defect. Click here to see and learn more about the numerous companies specializing in metal polishing on IndustryNet. A burr is a raised edge or small piece of metal remaining on a part after machining. Deburring is the process of removing burrs. Manual deburring is the most common process. It requires only a few inexpensive tools. When a piece is deburred in this way, it can be instantly inspected, and the process stopped or continued as necessary. Electrochemical deburring uses a salt or other solution and electricity. It employs a special tool in areas that are difficult to reach such as intersecting holes. Burrs are removed very quickly while the rest of the piece is unaffected. Thermal energy is used to access multiple hard to reach areas simultaneously. In this spectacular process, pieces to be deburred are introduced into an explosion-proof chamber. A gaseous mixture of fuel and oxygen is electrically ignited, and in milliseconds, burrs and sharp edges burn away. Cryogenic deburring uses the frigid temperatures of liquid nitrogen, liquid carbon dioxide or dry ice, instead of the heat of an explosion, to remove burrs from die-cast metal parts. Pieces are cooled until burrs become brittle and can be eliminated by tumbling or with blast media. Plastic is also deburred by this method. Mechanical deburring either grinds down burrs and sharp edges or rolls them into themselves, rather than completely removing them. The process was developed in the 1960s as a quicker method than manual deburring. It was first applied to bakery racks. Grand Rapids Polishing & Buffing Inc. is a family-owned business in Grand Rapids, Michigan. It deburrs zinc, stainless steel and aluminum. The work is done both by automated equipment and by hand by personnel with at least 10 years of experience. The company will accept both high and low volume jobs. Stanley Industries Inc. in Cleveland, Ohio, is both a vendor of finishing equipment and supplies and a mass finishing job shop. Mass finishing handles large numbers of parts, generally at a lower cost per piece. This company has been involved in the industry for 70 years. It has been ISO registered since 2005. Click here to learn more about the numerous companies specializing in deburring on IndustryNet. With information on over 400,000 manufacturers and 10,000 suppliers, IndustryNet is the resource to locate providers of metal finishing services quickly. A free online search will readily produce a list of shops both by capabilities and geographic area. Customers can easily obtain a quote or contact a vendor directly or by social media. Related Companies: Automation Plating Corp., Chem-Plate Industries, Inc., Gascoigne Company, Global Metal Finishing, Inc., Grand Rapids Polishing & Buffing, Inc., MAH Machine Co., Inc., Metallic Bonds Ltd., Midwest Grinding Co., Inc., Precision Metal Finishing, LLC, Professional Plating Inc., S & B Finishing Co., Inc., South Haven Finishing, Inc., Stanley Industries, Inc.